The booklets are aimed to help inform the public about their rights and how Parliament functions, amongst other areas. In brief remarks, Speaker of the House, Dr. Barton Scotland said that he is grateful for the publications. “This publication has extraordinary possibilities because one it is a very readable book and one who is interested would find it easy to carry around and to look. Secondly I see one intended for children, it is an excellent start”, Dr. Scotland was quoted as saying by the Government Information Agency (GINA). The Speaker said that the booklets give the House a platform to build on. He noted that a number of initiatives have been made to reach out to citizens so that Parliament is no longer considered a mysterious place. The booklet is divided into three categories. These are Parliament and Government, Rules of the Game and Parliamentary Sign Posts. 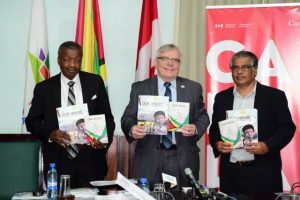 It was highlighted that 3,000 copies (1,500 copies each) were printed however 2,600 copies were handed over to the Parliament whilst the remainder is divided between the High Commissioner of Canada to Guyana and the President of the ACM. High Commissioner of Canada to Guyana, Pierre Giroux said that the development of the booklets offer new opportunities for “wider engagement and branding the discourse on national politics.” He noted that it will also help foster stronger communities and greater participation. The High Commissioner said he is proud that through the Canada Fund for Local Initiatives (CFLI), ACM was able to publish the materials. The parliamentary booklets is a collaborative effort between the Association of Caribbean Media Workers (ACM) and the Parliament of Guyana with funding under the Canada Fund for Local Initiatives (CFLI) and the High Commission of Canada to Guyana.